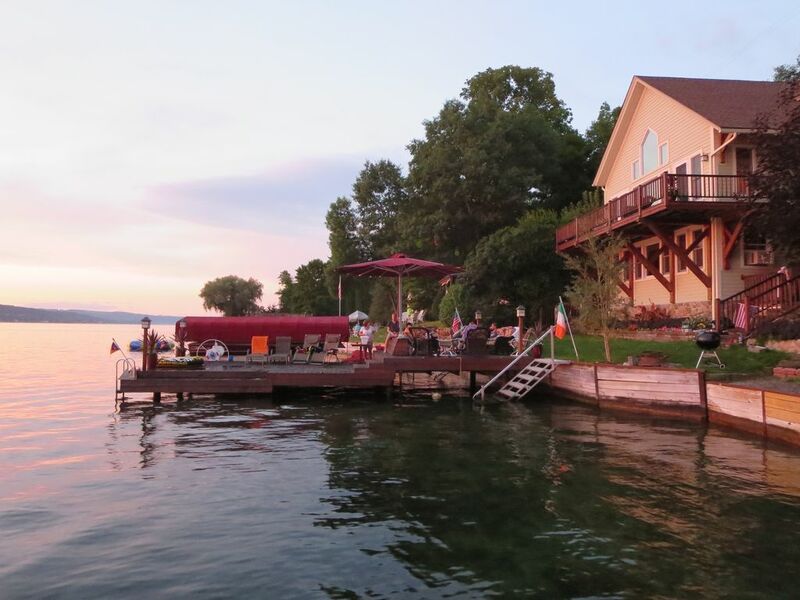 Luxury, Pet Friendly AT LAKESIDE ON KEUKA'S DESIRABLE EASTSIDE with great SUNSETS. Air Conditioned. Fantastic 4 BR 3.5 bath year round getaway beckons those wanting comforts of home w/lakeside perks! ! Finished basement with (2) twins for the kids. High speed internet, dishwasher, washer-dryer, covered & open DECKS for shade & sun seekers, fire-pit for toasting those marshmallows, 750 Sqt ft. DOCK. Your Living Room on the lake. BREATHTAKING LAKEVIEWS with its renowned SUNSETS! Within close proximity of quaint area villages, restaurants (by boat or car), vineyards & winery trails, public parks & boat launches, conveniences, nearby marinas for fishermen, and tourist attractions. Boat, JetSki, Kayak and Bicycle Rentals available. Air Conditioning. Canoe. Boat and Jet Ski rental options. Maximum 3 vehicles by the house. Unlimited on my property on Rt. 54 a short walk away. Lakeside CC and Bath CC within a short drive away. Fantastic views and a house that lives bigger than it looks. Plenty of space for entire family of 7 adults and 4 kids. If your modest or prefer privacy, the master loft may not be for you, but I loved the view straight out to the lake with the strategically place windows and the open bath made the room feel larger. The deck was large and well put together and great lights at night. The large umbrella kept us cool in the afternoon. Bob was a great host and was there to check us in and checked back with me several times throughout the week to ensure everything went well. We would definitely go back! Bob was a fantastic host, very responsive and knowledgeable of the area. The Lakehouse was very clean and spacious, the wood-workings are just unreal. We had plenty of room to host our family reunion. The dock was the center of our activity. We booked this beautiful home for a family reunion. It was the perfect place for our group. The huge dock was our favorite place to gather and hang out all day into the evening. As we prepared dinner on the grill each night, we enjoyed beautiful sunsets overlooking the lake while we had cocktails on the upper deck. Bob was an excellent host and took great care of us. One of the shower drains was clogged up, but as soon as we reported it to Bob he had someone over to fix it within the hour. We are doing another family reunion here this Summer. Can't wait!